What is asset allocation and how it is important to investing? Asset allocation is an investing strategy implemented by professional fund managers to balance risk and return by dividing the portfolio’s assets according to the investor’s goals, risk appetite, and investment horizon. 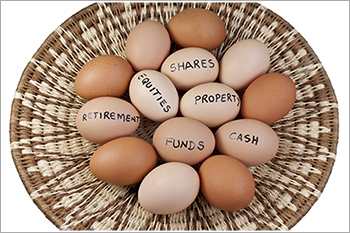 A very famous English saying fits very well as an advice to stock market traders -- ‘Don’t put all your eggs in one basket’. This saying is a metaphorical description of asset allocation; which implies that diversifying investments is beneficial for the investor to reach their financial goals in time. Asset allocation is a term often used in the stock markets and the mutual funds market. The commonly available investment avenues are hybrid, equity, debt, and cash. Through asset allocation, investments are spread among these avenues to realize the financial goal of the investor. However, due to the volatility of the markets, this asset allocation is often changed to achieve the end goal. Why is asset allocation needed? The constant point of any market is its volatility, so maintaining the same investment levels will not help in achieving the estimated returns. So, experts shift the assets at varying levels in every type of investment so that the profit in another will balance the loss of one asset. The absence of asset allocation can lead to ad-hoc investing, and the investor will be unable to gauge whether the portfolio is generating profit. However, with the help of proper asset allocation, the investor can determine the returns they expect from their investments. If the investor has earned a profit before by investing only in equities, he/she starts believing that staying invested in equities will give them the same profit they earned over the years. However, that is not the case, as the investor will fail to consider the dynamic market situations. In case of loss from their investment, the investor will turn to more traditional forms of investment like PPF or bank FDs. However, asset allocation helps investors to minimize the risks and get more clarity on attaining their financial goals. When investing, not only are the financial goals necessary, but the time horizon of the investment also matters. Asset allocation helps investors time their investments and allocate their corpus to a correct mix of equity, debt, stocks, or even cash. Liquidity is one of the essential factors of asset allocation. It helps with investment decisions as some investments come with a lock-in period such as the ELSS, where the mandatory lock-in period is three years; Provident Funds, whose lock-in period is about five years. In such cases, prudent asset allocation helps investors park their funds in investments that give them liquidity. The main reasons for long-term investing are wealth creation or the need to realize specific goals like education, marriage, or home purchase. Asset allocation assists in achieving these goals by spreading the investments across sectors and also to change those investments according to market behavior as and when needed. It helps one adjust the risks as all asset classes will not give the same returns at a given point in time. Financial experts believe that correct asset allocation, on the other hand, will help you realize, at the very least, 90% of your financial goals.